They can be removed surgically, but there are many methods to safely removing these at home. Frankincense can be applied directly to the tag but a patch test should be done on the skin first to check for sensitivity. The oil can be diluted with a carrier oil for sensitive skin. This may need to be done daily for 1-2 months until the tag falls off. It will continue to shrink during this time. As with the frankincense, tea tree oil can be diluted for sensitive skin. This acidic, natural antiseptic has a protective effect, even after the tag is gone. Apply the oil to the skin three times daily or more and the skin tag will dry out and eventually fall off. Form a thick paste using baking soda and castor oil. Apply the paste three times daily for three weeks. This strong remedy will cause the tag to shrink and fall off. Treatment can be continued if three weeks is not long enough. 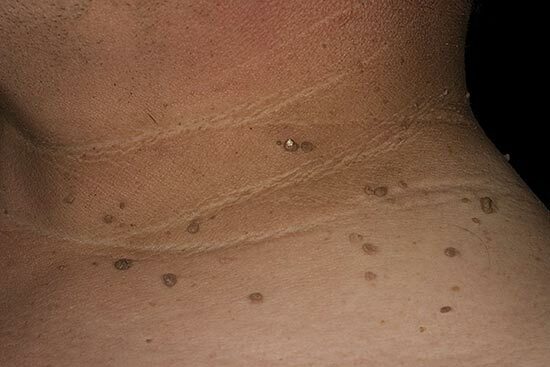 Although one must use caution with the heat of garlic, it is an excellent natural treatment for skin tags. Slice a clove of garlic thinly. Take a slice and cover the tag, then cover with duct tape. Replace with fresh slices as needed. Leave application for the entire day, and rinse skin before bed. Repeat this for three days and the tag should fall off. If it does not, the treatment can be repeated in a few days.